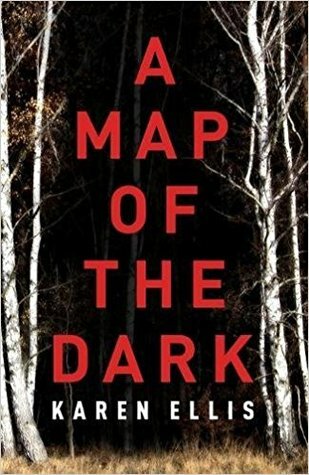 Today I'm featuring my current read, A Map of the Dark by Karen Ellis (a pseudonym of longtime crime fiction author Katia Lief). This is the first book in a new series called The Searchers. The excerpts shared are from a copy I borrowed from the library. She likes the feel of the ground underfoot and so she toes off her sneakers and carries them, swinging loosely from her fingertips. But after a couple of minutes she steps on something sharp and changes her mind. Roy's eyes are cloudy. He blinks and suddenly they're hazel again, like they used to be: green-streaked riverbeds of timeworn memory. Elsa gently squeezes his hand, hoping he'll say something, anything, as unexpectedly as his eyes gained color. He hasn't spoken all morning. He lies there, his short salty hair poking in every direction, staring at the charcoal screen of the turned-off television, taking in the latest news of his diagnosis. Page 56: "She should have done what she'd told Lex she was doing and gone into the office. Maybe she still will, if only to erase her lie." My thoughts: The opening lines of the prologue and first chapter don't convey much of the plot, which revolves around the disappearance of a 17 year old girl, who never made it home from her job at a local coffee house. It is up to FBI Special Agent Elsa Myers to find Ruby Haverstock, despite a lack of promising leads and pressing personal matters of her own. I found myself fully engaged in the story after completing the prologue and first chapter. Elsa Myers is an interesting character with a curious past that is slowly being revealed. I keep reading "just one more chapter" (or two) because I find Elsa every bit as compelling as the investigation and its outcome. This Friday Focus post was originally composed, compiled, and published by Catherine for bookclublibrarian.com. It cannot be republished without attribution. Retweeting and sharing on Google+ are appreciated.